Flame Tree Adoptions: MINA Board member Chuck Sayon, Nancy Rushmer, Rep. Cinta Kaipat, and Doreen Jesus of Guam pose with some of the Adopt-a-Flame Trees. Beautify CNMI is gearing up for another round of tree plantings this year with an Adopt-a-Flame Tree program. Beautify CNMI! is asking members of the community and business owners to “adopt” a Flame Tree by donating $20 per tree to the Mariana Islands Nature Alliance. Adoptees will be invited to the plantings, but if they can not make it, they will receive a photo along with the GPS coordinates of their adopted tree. Doreen Jesus and Greg Pangelinan of Guam each adopted a tree for Jesus’s son, US Army Sergeant Jesse Castro, who lost his life serving in Iraq last December. Castro was buried in Guam, but his father, Jesus Castro, is from Saipan. The adoptees from the Flame Tree Festival are Aya Matsumoto (2), Shirley’s Coffee Shop (3), Nancy Rushmer, Ian Catlett, Calvo & Clark LLC, Don Bader, Nathan Tan, Doreen Jesus, Greg Pangelinan, and Bree Reynolds. 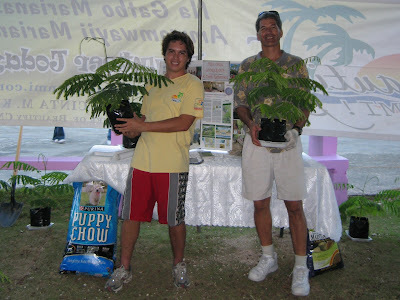 In 2006, Beautify CNMI planted 22 Flame Trees along Beach Road and in January 2007 they planted 4 more. 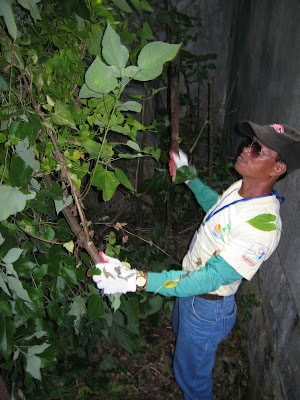 To adopt a Flame Tree, contact Angelo Villagomez at 483-1078 or angelovillagomez@gmail.com. That's not trash: Beautify CNMI partners promoted recycling at this year's Flame Tree Festival. The Arts Council graciously donated a tent to Beautify CNMI! 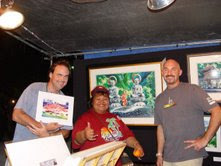 at this year's Flame Tree Arts Festival, the largest festival of its kind in Micronesia. Using recycling bins borrowed from Division of Environmental Quality, Beautify CNMI promoted aluminum can and plastic bottle recycling during the four day event. Student Volunteers: Volunteers from San Vicente Elementary, Koblerville Elementary, and Hopwood Junior High School helped Beautify CNMI man the tent. Volunteers from Marianas RC&D, Mariana Islands Nature Alliance, Rep. Cinta Kaipat's Office, Hopwood Junior High School, San Vicente Elementary, Koberville Elementary, and Friends of the Mariana Islands helped Beautify CNMI! staff the tent from the opening to the closing cermonies of the festival. Thanks to everyone who helped out! The Tree Guys: Angelo Villagomez and Ken Kramer of Marianas Resource Conservation & Development Council (RC&D) pose with some of the Adopt-a-Flame Tree trees. RC&D hosted a tree care workshop in January and leads the tree planting activities of Beautify CNMI. 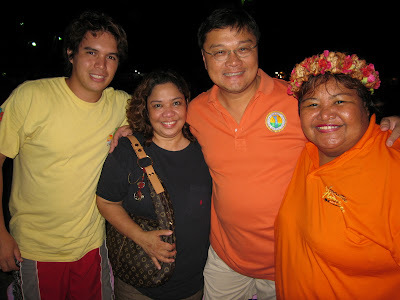 The Flame Tree Festival was the perfect opportunity for Beautify CNMI! to kick off the Adopt-a-Flame Tree program. Beautify CNMI! partner Marianas RC&D planted Flame Trees along Beach Road last year, hosted a tree care workshop for CUC, DPW, and Parks & Recreation earlier this year, and plans to continue the replacement of the missing and/or dying trees along Beach Road. At this year's festival 13 Flame Trees were adopted. They will be planted a the onset of the rainy season. The cost to adopt a Flame Tree is $20. If you or your business would be interested in adopting one or several trees, please contact Angelo Villagomez. 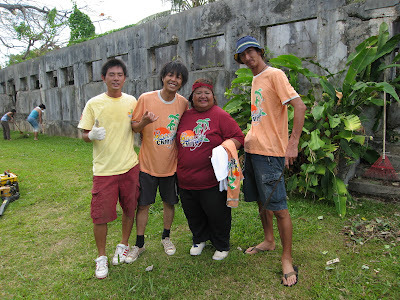 Super Volunteers: (right to left) Angelo Villagomez, Susan Macario, Jerry Tan, and Cinta Kaipat pose for a photo. We also sold T-shirts, buttons, stickers, and MINA annual memberships. In total we raised $748. 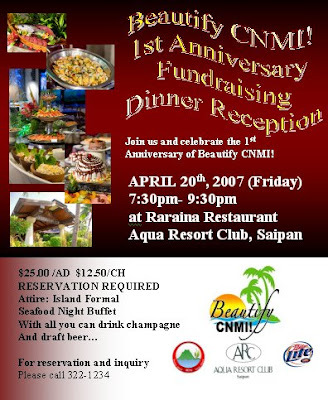 These funds will support Beautify CNMI! programs in the upcoming year. Tan Holding's Shirley's Coffee Shop donated $260. They purchased three Adopt-a-Flame Trees, a MINA corporate membership, and donated $100 towards the purchase of a trash trailer for our cleanups! Thank you Shirleys! Earth Team Award Winners: We handed out individual certificates to all of the MOVER members who helped us win an USDA Earth Team Group Award. In addition to fundraising and recycling, we also had a few meetings. The Animal Welfare Committee met inside the tent on Thursday to discuss the upcoming National Pet Week and Boonie Dog Pet Show. On Sunday we presented MOVER members with their individual certificates for winning the 2006 USDA Earth Team Group Award. Thanks again to everyone who helped us this weekend! Taga Beach is on the South end of Tinian, within walking distance of the village of San Jose village and the Tinian Dynasty Casino. Right next to the beach are picnic facilities, parking, and even a place to rent a scooter. 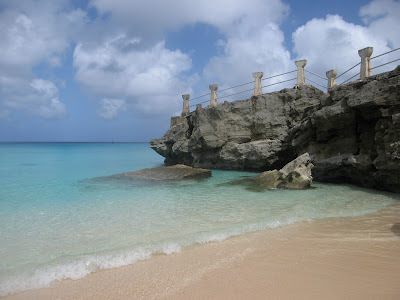 It is a small pocket beach with small limestone cliffs on either side. To get down to the beach one has to climb down some rocks, but most prefer to just jump into the clear green and blue water from the small cliffs. This is the most popular way to enjoy Taga Beach. 1. Walk down the concrete path in the above photo to get to the edge of the cliff. 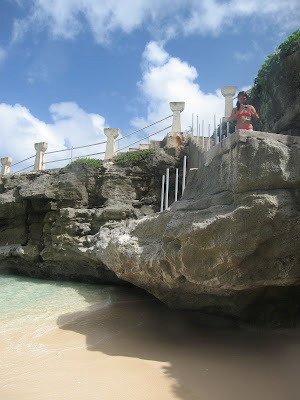 You have to climb up the rocks in the following picture to get off of the beach. 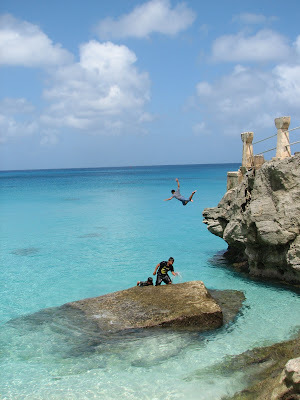 If you don't think you can climb these rocks, don't jump in the water. I'm not sure how I feel about the latte stone railing. While I can appreciate the need to keep people safe, think how beautiful these rocks would be without the metal and concrete. 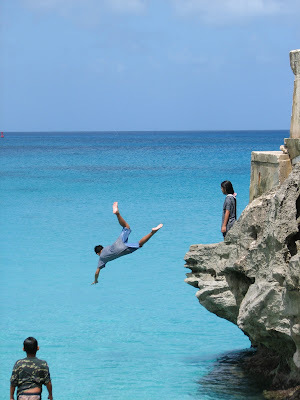 The kids on Tinian have turned jumping off these rocks into an art form. They pressure each other to jump a little higher, or to throw in a flip, or to get more of a running start. They obviously don't challenge each other to be more graceful divers. The kid in the previous two pictures performed belly flop after belly flop after belly flop. 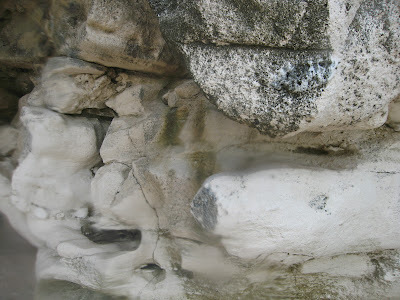 If jumping off the cliffs ever gets tiring, you can check out the limestone along the beach. The waves have carved some pretty crazy shapes. 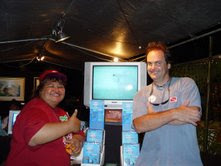 Hey there, Beautifyers -- If you're looking for an excellent video that takes you into the wonderful sea world and the best dive spots in Saipan, go see Mike Tripp's Booth, which he shares with Greg Eilliot, the famous resident artist whose paintings are displayed here. View sceneries of Saipan through the eyes of this gifted artist! Today's the last day of the Flame Tree, but if you miss them today, you can still contact them after this Festival. Send me an e-mail at cintamkaipat@gmail.com and I'll put you in touch with them. 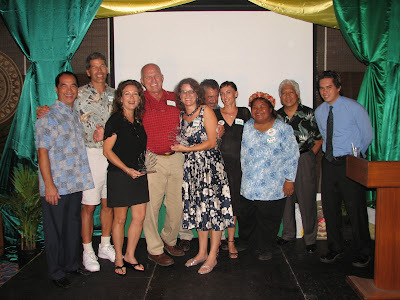 During our one year anniversary banquet on Friday night, the committee chairs gave out Governor's Beautify CNMI awards in two categories, the Environmental Champion Award and the Environmental Steward Award. This year's winners were Bree Reynolds, Kathy Yuknavage, and Captain Carl Brachear. 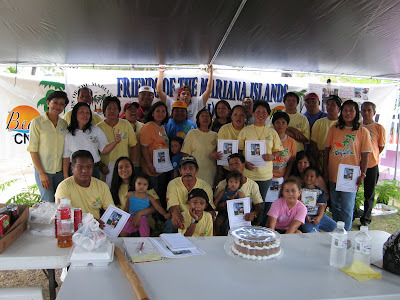 This year's winners were Adam Sablan and Friends of the Mariana Islands (FMI). We also presented FMI with the 2006 USDA Earth Team Group Award. This year, Beautify CNMI! and PAWS are proud to celebrate National Pet Week. National Pet Week was established in 1981 by the American Veterinary Medical Association to promote responsible pet ownership, public awareness of veterinary medicine, and celebrate the human-animal bond. It is now celebrated throughout the United States and other parts of the world, including the CNMI! In 2007, National Pet Week will be observed from May 6-12. In observance of this special week, Beautify CNMI!, PAWS, and DLNR’s Dr. dela Cruz have planned numerous events intended to educate the public about the benefits of responsible pet ownership. To further these efforts, local businesses like Ace Hardware and Costco, are offering discounts on animal care items – so stock up while you can! Beautify CNMI!, PAWS, and DLNR have planned a well-balanced week to help the community experience the benefits of responsible pet ownership. 1) May 7-11: The PAWS Education Committee will launch their education program in schools around the island. Through the program, children will learn how to responsibly take care of animals, learn about animal behavior and how to approach an animal safely, and learn how to feel compassionately for animals. 2) Monday, May 7, 2007 at 7:00 a.m., Katie Busenkell, a PAWS Board Member and the Chair of Beautify CNMI!’s Animal Welfare Committee, will be on the Harry Blalock Show. The topic of conversation will be the newly introduced Animal Protection Act, why responsible pet ownership is so important for our community, pet care tips, and events planned for National Pet Week. 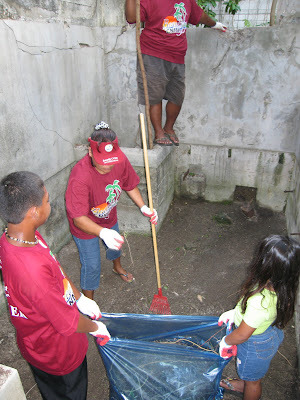 3) KZMI, Beautify CNMI! and PAWS recently recorded pet care tips that will be broadcasted over the radio. The tips will be played throughout the month of May in observance of National Pet Week. 4) Tuesday, May 8th, 8:00 a.m - 11:00 a.m.: Dr. dela Cruz, from DLNR, will hold a special clinic in observance of National Pet Week at the DLNR Animal Health Center. Services that are available include: parvo vaccination for $5.00, a combo vaccination for $10.00, treatment for skin diseases, and Revolution prescriptions for $5.00. Revolution is a topical parasiticide that is applied to the skin of dogs six weeks of age or older, and is used to: prevent heartworm; kill fleas, flea eggs, ticks, and ear mite infestation, AND kills roundworms and hookworms. Revolution is also used to treat and control sarcopic mange. What is sarcopic mange? It’s a skin mite that eats your dog’s skin, and it’s itchy! It also causes the dog’s hair to fall out. So, all those dogs you see sitting by the side of the road hairless and itching themselves raw – they have it and they need treatment by a licensed veterinarian. The Booniest (Best of Show). Prizes include certificates for free vaccinations at DLNR’s clinic, a gift basket from Ace Hardware, animal care items from Costco (like large bags of dog food, treats, and toys), a three month supply of Frontline, collars and leashes, and flea and tick shampoo. This is not a serious event. Rather, it is intended to bring family and friends together to laugh at ourselves, and of course, the animals we love. Dogs don’t even have to know how to sit (and if they don’t, we suggest you sign them up for “Most Disobedient” category). All your dog has to do is walk a short distance in front of three celebrity judges on a leash. The dog with the most points wins the prizes - that’s it!! 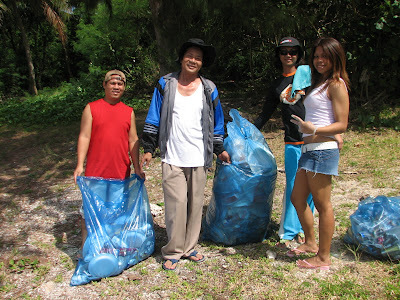 Following the event, Beautify CNMI! and PAWS will do a clean up of the bomb shelters. Again, everyone and their dog(s) are invited to participate in the clean up. If you have any questions on the events that are planned for National Pet Week, please email Katie Busenkell at busenkell@gmail.com. 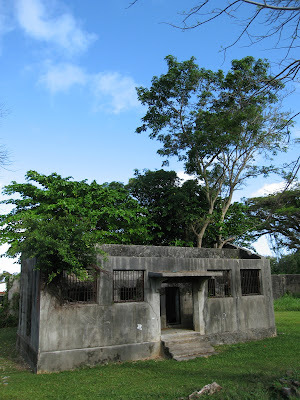 The CNMI is not lacking in old historical sites, but we are lacking in funds to take care of them. The Old Japanese Jail is no exception. It is along Middle Road in Garapan, right in the middle of a residential neighborhood. An Auto Repair shop sits right next to it, too. Beautify CNMI! 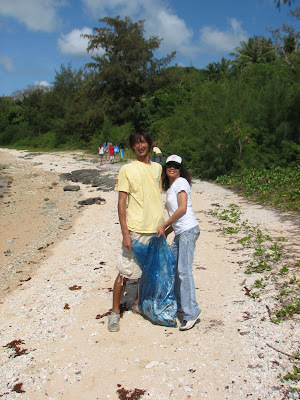 partnered with Northern Marianas College and volunteers from Mariana Islands Nature Alliance, Friends of the Mariana Islands, ISK8, Rep. Cinta Kaipat's Office, Rep. Absalon Waki's Office, ISA CNMI, and Troops to Teachers to clean up this historical tourist spot on Earth Day 2007. We were very careful not to harm the decades old structure. Vegetation is growing into the sides of several of the structures and large portions of the building are literally crumbling after surviving World War II and decades of earthquakes and typhoons. We didn't touch the structure. All we did was cut the grass, remove litter, and pull some weeds. The largest structure at the Old Japanese Jail historic site is the Main Jail. There is a single row of different sized jail cells, each meant to house between 1-6 prisoners. All that remains of the structure are concrete and rusted metal. Each cell had a wooden floor about two feet off the ground (you can see where it was in the following picture) and a Japanese style toilet in the corner. 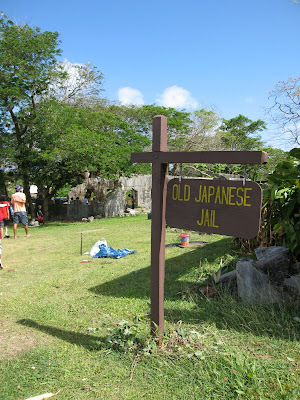 The jail held Japanese, Okinawan, and Chamorro prisoners. 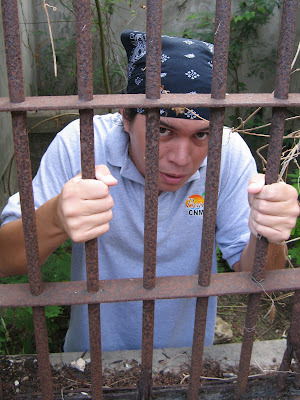 Most of the Chamorro prisoners were held for drinking alcohol, which was forbidden by the Japanese Administration. The main jail has a lot of "historical graffiti:"
Someone named J.A. Beiser left his mark on the Japanese Jail. June 15, 1944 is the day that the Allies landed on Saipan. No one has ever found J.A. 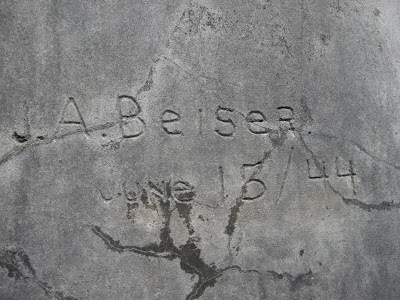 Beiser, so we can only guess as to why he carved his name. Was he being held in the jail and released when the Allies landed? Did he carve this on June 15? Did he die during the landing? Did someone else carve this? We'll probably never know. 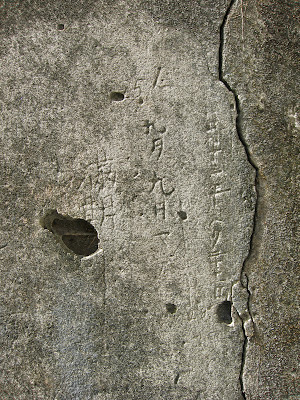 Some of the prisoners also left their mark. This is carved into the cell where Amelia Earhart is purported to have been held. Can you read Japanese? Care to translate? 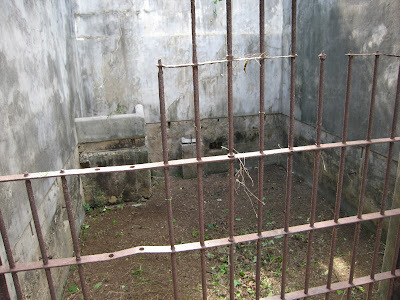 Outside of the main jail are the remains of two small structures. This is the old water well. When we found it, it was full of garbage. We cleaned it out, but didn't find any water. The other structure is what I have affectionately coined the "Tea House." A more appropriate name for the Tea House might be the "Torture Chamber" or simply, "The Hole." 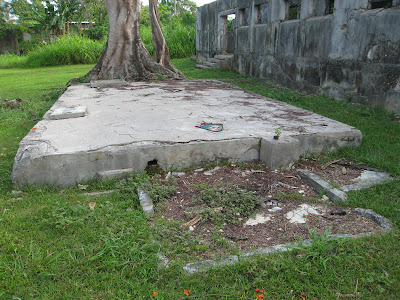 The small square in front of the larger concrete structure is believed to have been a staircase leading down to a door for this underground structure. That little rectangular hole on the center left provided all the light for the unfortunate prisoners inside. 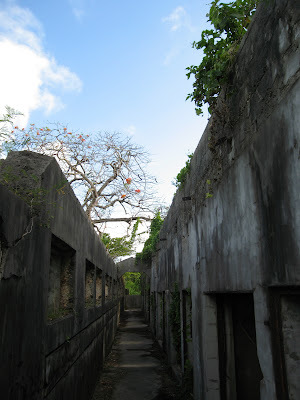 Chamorros who survived the war have described to historians how this underground structure was used to house the really bad prisoners. Once you were thrown into the Tea House, you usually weren't brought back out until you were dead. 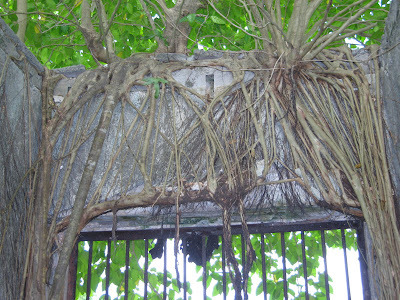 The vegetation growing in and on top of the structure can not be removed without harming it. Sam McPhertes told us a story about how the mess hall sink doubled as an interrogation room. The prison guards filled the sink with water and asked the prisoner if they were guilty. If they said "yes," they were thrown in jail, but if they said "no," their head was forcefully dunked into the sink. After a few seconds with their head in the water, they were asked again if they were guilty. This was repeated until the prisoner confessed. 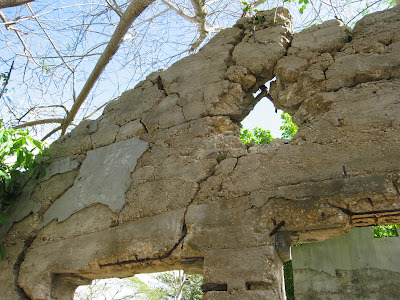 The other remaining structure at the Old Japanese Jail historical site is a large concrete wall. 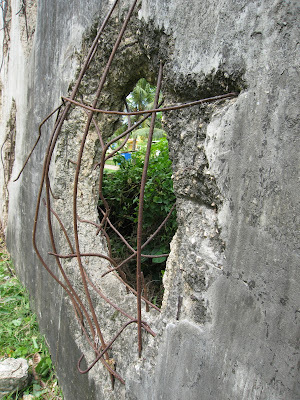 Like many of our historical sites, the wall is covered in clues as to how violent the Battle of Saipan was. It is not know what this wall was used for. Could it have been for executions? Those bullets could be from the war, or from the guards taking target practice, or from a farmer shooting his chickens. Who knows? A mortar shell must have hit the wall here (I don't think a farmer shooting his chickens did this). 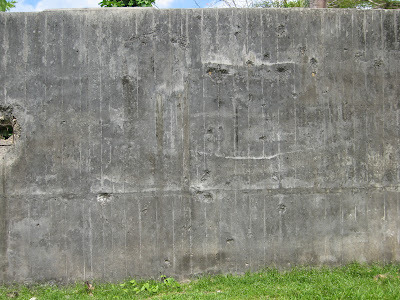 This is steel reinforced concrete. Look how the impact just bent the rebars! 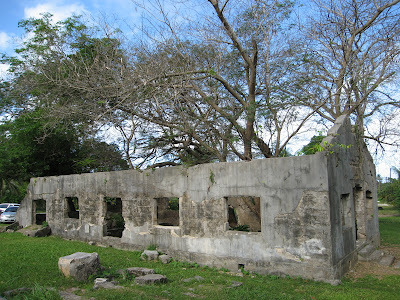 If anybody would be interested in heading a Restoration sub-committee to restore historical sites in Saipan and throughout the CNMI, please contact me and we'll put something together. 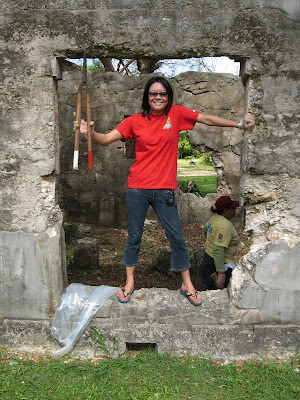 Thanks to everyone who volunteered to restore this important historical site! 17 volunteers braved intermitten rain showers to clean up Wing Beach on Saturday morning. This has turned into my favorite cleanup of the month because there is hardly any trash! We picked up left over bits of picnic trash, old batteries, and discarded containers of motor oil. 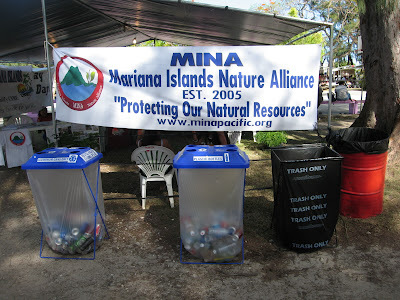 MINA has adopted Wing Beach as part of the Beautify CNMI Adopt-a-Spot program. They clean Wing Beach every other month and pay for weekly trash pickup at the North entrance to the beach. Today Exxon-Mobil donated $2500 to Friends of the Mariana Islands to support their environmental projects. Pictured above (from left to right) are EJ Lee, Rina Manabat, Angelo Villagomez, Cecile Suda, Marites Castillo, Jun Palad, and Rene Vergara. This is a good week for Beautify CNMI! We won an EPA Award, received this donation, and tomorrow we have our one year anniversary banquet. Bank of Guam also called me today to let me know that they are going to donate $500 to Beautify CNMI to pay for a trash trailer. What can I say but, Woot! NGIWAL, Palau — Sitting on a bench in a thatched hut in this village on Palau’s main island of Babeldaob, Islias Yano, 57, looked over the bay he has fished professionally since he was 15 and recalled the fishing practices of his boyhood. “We fished certain fish in certain seasons,” he recalled. “Each reef could only be fished by people from a certain village.” Village elders would rotate fishing on reefs, he recounted, to husband their slow-growing main source of food. Starting in the 1980s, population growth, new seafood markets in Asia and modern ways of thinking washed away the elders’ authority and rules. “Outsiders started coming into our reefs, they used scuba gear and dynamite, and the fish got smaller and fewer,” Mr. Yano said, shaking his head. In the world’s tropical seas, full-grown snappers and groupers became as rare as full-grown tuna or cod elsewhere. In Ngiwal, the reaction was not long in coming. Once again, the elders ruled. In 1994, they banned fishing in a small area of reef that was partly accessible on foot. The village women, who traditionally gather shellfish at low tide, noticed how the fish became more plentiful there in a few years. The reef became locally famous, and other villages started to do the same. Today, Palau, a tiny island state 600 miles east of the Philippines that is internationally known as a site for recreational diving, is at the forefront of a worldwide movement to ban fishing in key reefs to allow the return of prized species. It now protects a patchwork of reefs and lagoon waters amounting to 460 square miles. At a November 2005 meeting of the United States Coral Reef Task force in Koror (the Republic of Palau, independent since 1994, still qualifies for certain domestic financing from the United States), President Tommy Remengesau Jr., probably the world’s most conservation-minded head of state, caused a splash with his so-called Micronesian Challenge: a call to the rest of the region to set aside for conservation 30 percent of coastal waters and 20 percent of the land area by 2020. Palau already has that amount, though not all of it is policed, but the rest of the region has far less. Palau’s challenge has come at a time when reef-fishing communities around the world are discovering that setting aside no-fishing areas yields dividends in a few years because the resurgent fish populations spill over into areas where fishing is allowed. Without as much support from their national government as Palauans enjoy, local authorities in Fiji have raised the number of no-take zones to 189 from 2 in 10 years. Two years after Ratu Aisea Katonivere, a traditional chief, imposed a no-take zone, “The fish are closer and bigger,” he said. “They are coming back; it’s a miracle.” Mr. Katonivere, who rules over 7,000 people in the Great Sea Reef, the world’s third-largest barrier reef, spoke in an interview during a conservation conference in Honolulu. Other participants said that in the Solomon Islands, the protected areas have gone to 30 from 2 in just five years, and in Vanuatu, they exceed 100. The Micronesia Challenge has resonated far beyond Micronesia. Five months after Mr. Remengesau issued it, President Susilo Bangbang Yudhoyono of Indonesia pledged to increase marine protected areas to 24.7 million acres from 18 million acres by 2010. In the Antilles, the states of Grenada, the Bahamas, Belize and the Grenadines, which have already protected some reef areas, have committed themselves to a Caribbean Challenge and are trying to persuade the other nations to make similar pledges, according to Bill Raynor, the Nature Conservancy’s director for Micronesia. But in the United States, marine protected areas are less than 1 percent of near-shore waters. In Hawaii, where the reefs are largely depleted of fish, a “right to fish” bill recently approved by the state house of representatives would make it almost impossible to create any protected areas by requiring unattainable scientific data. That Palau has taken the lead in ocean conservation is no accident. Even among Pacific peoples, Palauans have been known for prizing fish and seafood over meat and farmed vegetables, and its fishermen have stood out for their keen understanding of the reefs. 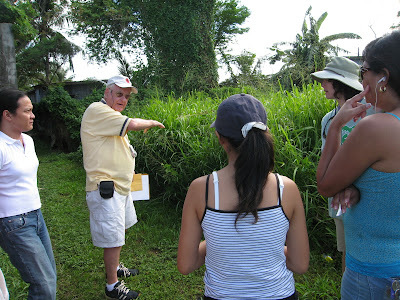 A Canadian marine biologist, Robert E. Johannes, was the first to tap the Palauans’ knowledge of marine biology by interviewing them and fishing with them in the 1970s. When diving became popular, in the 1990s, Palauan fishermen were able to take foreigners to sites with extraordinary numbers and varieties of fishes and corals, and the island became one of the world’s top diving destinations. This brought a measure of prosperity to the 14,000 Palauans (unemployment is 2.9 percent), and it reinforced the views of fishermen like Mr. Yano that plundering reefs is a bad idea. In 1997, 330 square miles in the Rock Islands lagoon favored by divers were closed to commercial fishing and the killing of sharks anywhere in Palau’s waters was banned. Also protected are the Napoleon wrasses, fish that can reach five feet and are worth up to $10,000 alive in Hong Kong. They have been decimated almost everywhere else, but Palau now boasts one of the world’s largest densities of them, a major attraction for divers. In 1998, a so-called El Niño event involving major sea current changes sent unusually warm water to several countries around the world, causing the corals there to turn white and die. In Palau, the bleaching event killed off a third of its corals on average, but the proportion was much larger in the outer reefs whose dense fish populations, clear water and dramatic drop-offs are the main attractions to divers. At the time, Noah Idechong, the country’s leading environmentalist and founder of the Palau Conservation Society, had recently been elected to the lower house of Parliament. “We realized that our no-fishing areas could not protect us from global warming and reef bleaching,” he said. With the support of the Nature Conservancy, Mr. Idechong (pronounced idda-ONG) introduced legislation to integrate the patchwork of existing protected areas— some imposed by the government for tourism, others established by villages along the coast — and add another 30 percent from those that best resisted bleaching, or recovered fastest from it, he said. Today, the network design is close to being completed, and by the end of the decade — 10 years before the president’s 2020 pledge — it should be fully in place, Mr. Idechong said. To monitor the health of the reefs and curb poaching, Palau needs $2.1 million a year, officials say. Foreign donors are expected to create a $12 million trust fund, and the rest will come from an added tax on divers, said Mr. Raynor of the Nature Conservancy, in an interview in Pohnpei, in the Federated States of Micronesia. Because Palau is far ahead of the others, “It’s really important we succeed, because the whole world is looking at us,” Mr. Raynor added. 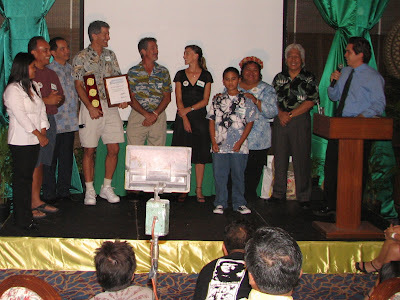 Saipan Tribune's 2006 Person of the Year Beautify CNMI! turns one year old this month and is hosting a dinner event this Friday to celebrate this milestone. “We wouldn’t have done as much as we have done if literally thousands of people hadn’t pitched in over the last year. 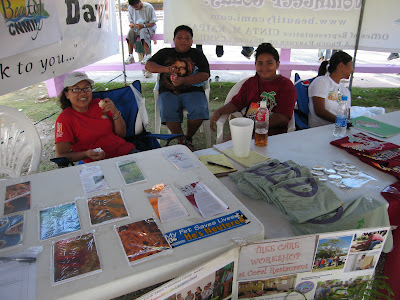 In 12 months we have created the We Love Saipan Network, a network of over 50 local writers and bloggers publishing stories about life in the CNMI; organized 1020 on 10/20, where 3,000 plus CNMI residents came out to volunteer on a single day; MOVER won a National USDA Earth Team Award volunteering with Beautify CNMI, and you guys named us Person of the Year,” Villagomez said. Environment advocate Beautify CNMI! was named an environmental hero during the recently concluded Environmental Protection Agency Region 9 Environmental Awards. Beautify CNMI! was awarded the honor during the agency's 9th Annual Environmental Awards Ceremony in San Francisco yesterday, joining 13 other environmental heroes in Region 9 that includes California, Arizona, Nevada, Hawaii and the Pacific Islands. The Hopwood S.A.V.E. club voted to become a youth chapter of Beautify CNMI so our outgoing 8th graders can continue to be actively involved. Starting next year, this group will meet in the evenings once a month and will be open to youth from all middle and high schools, both public and private. This summer we are sponsoring a two week outdoor school. We need help planning the camp and will need community partners to lead activities and sponsor some of the costs of the camp. The first planning meeting will be next week on Thursday April 26 at 6:30 p.m. at Cafe at the Park. If you can not attend but are interested in being involved or have ideas, please email me at uncheesybree@msn.com or call me at 237-3477. It was announced today (although in San Francisco it was still yesterday, weird huh?) that Beautify CNMI is the recipient of an EPA Annual Environmental Award. Pretty sweet to find out about this during the week of our one year anniversary. Speaking of which, have you made your reservation yet? The Beautify CNMI Environmental Awards Ad hoc Committee met this evening to discuss the awarding of the 2007 Governor's Beautify CNMI Environmental Champion and Environmental Steward awards. The members of this committee shall remain anonymous. Come to the One Year Anniversary Banquet this Friday to find out the winners! The Laulau Watershed has been a focal point of the Beautify CNMI! campaign. 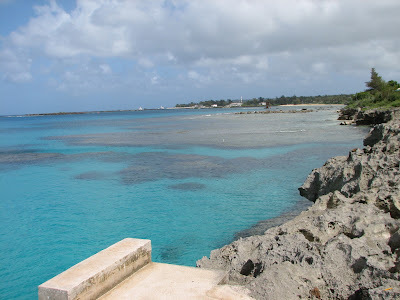 Laulau Beach is one of the 3 most popular dive sites in Saipan, attracting between 50-100 local and tourist divers per day. It is also popular with local fishermen. On most days you can see people fishing with a talaya, a rod and reel, or a speargun. It is also popular on the weekends as a place to BBQ and swim. 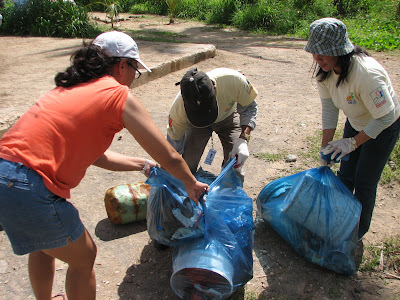 Our activities have included testing stormwater for sediment, cleaning up illegal dump sites, restoring streams, planting trees on the hillsides to prevent erosion, and removing marine debris and litter from the beach. We were at it again this weekend. On Sunday, April 15, 40 volunteers from MINA, FMI, ISA CNMI, Rep. Kaipat's Office, three local families and Beautify CNMI's newest proud partner, the Filipino Gay Association, cleaned up litter and marine debris from the beaches in Laulau Bay. 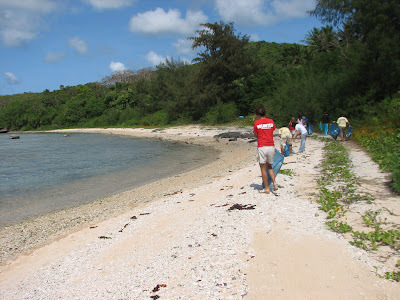 The volunteers were only scheduled to clean South Laulau Beach, but they were motivated to keep on going after they finished, so they all drove up to North Laulau Beach and cleaned up the dive site and the surrounding area. The total weight of all trash removed from both beaches was only 280 lbs. That is very encouraging! Although we still picked up our fair share of plastic spoons and beer cans, we are starting to see a drastic reduction in the amount of trash on the beaches! The Filipino Gay Association has decided to co-adopt North and South Laulau Beach with FMI, American Red Cross, and the other groups lending a hand. They have pledge to bring members to the Laulau cleanups on the third Sunday of every month. 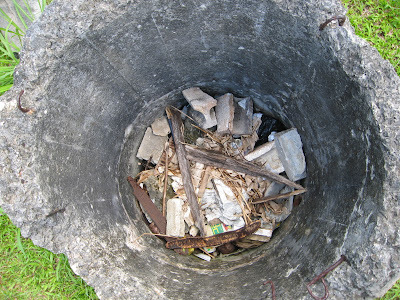 Next month's cleanup will be at North Laulau Beach, meeting at the divesite, on Sunday May 20 at 8:00 AM. Hope to see you there! 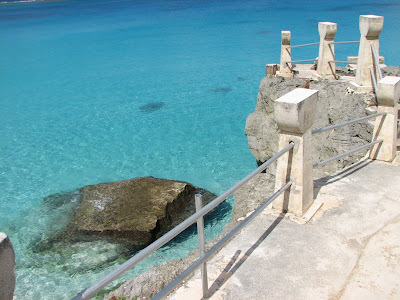 One of the projects that Beautify CNMI! indentified last year was tentatively called "War on Graffiti." We initially thought about gathering the kids and putting paint brushes in their hands and letting them paint over the graffiti. However, we thought that a better idea would be to get these kids to take ownership in these bus stops and buildings by inviting art teachers and local artists to submit mural designs to Beautify CNMI! so that we could get artists and kids to work on murals. This would be a better alternative to just painting over graffiti and, thus, creating a clean "canvas" for the graffiti monsters. Well, Beautify CNMI! 's cup runneth over, and we didn't get to this project in February. But, this month (April), we gathered at DPS headquarters for a press conference to announce the launching of this program. You can read the MARIANAS VARIETY article here. The following morning, Rep. Cinta Kaipat and Angelo Villagomez joined Principal Jonas Barcinas and the faculty and students of Dandan Elementary School to talk about the "War On Graffiti" Project. 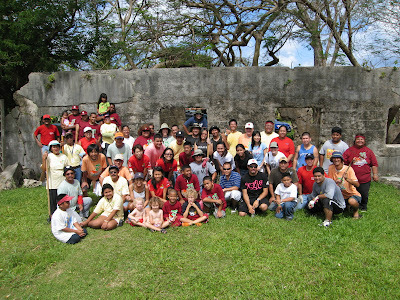 Dandan Elementary School was enthusiastic about getting started on the Project. Here are some pictures that were taken that day.